Since moving to Brownsburg three years ago, So Italian! has become one of my family&apos;s go-to dinner spots. So Italian! is a locally-owned restaurant that’s been in business since 2009. If you&apos;re visiting for the first time, one helpful hint: you order and pay at the counter when you arrive and then get a number that you take back to your table. With that introductory information out of the way, here are just a few reasons why my family loves So Italian! and yours will, too. So Italian! 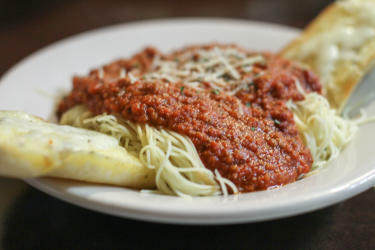 offers a wide variety of Italian entrees, including pizza, pasta, calzones, subs and more. My favorite meal is the meatball sub, which comes with a side of potato chips for just $6.50. But I also love the pizza, pasta, and calzones. My husband typically orders pasta, which comes with a side salad and garlic bread. So Italian! also has a great kids menu, and all kids meals come with a side of animal crackers which my daughter loves. Finish your dinner off with a traditional Italian cannoli or another dessert. So Italian! also serves wine and beer. To view a full menu, click here. For people with dining restrictions, finding restaurants with good options can be difficult. So Italian! offers several vegetarian pasta dishes as well as pizza and calzone options, and even serves gluten-free pasta or zucchini lasagna. I find So Italian! to be more affordable than most Italian restaurants. We typically walk away spending at least $10 less than we would at another Italian restaurant. Are you looking to cater an event? So Italian! offers catering starting at just $6.50 per person. That&apos;s a great deal, if you ask me! When I went to So Italian! this past Friday night with my husband and daughter, we sat next to a group of college girls reuniting during winter break, a couple relaxing with some good food and wine and a large group of families with several children. All three tables of So Italian! customers were very friendly to us and enjoyed interacting with our daughter, and no one seemed to mind when she made a little noise. It also seems to be the type of place where a lot of locals gather and run into each other, but because the people of Brownburg are so friendly, any visitor would fit right in. Location: 515 E. Main St. Brownsburg. Hours: 11 a.m.-9 p.m. Monday-Thursday, 11 a.m.-10 p.m. Friday, 11 a.m.-9 p.m. Saturday, Closed Sunday.